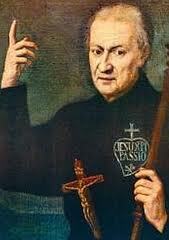 Paul Francis Daneo was born in Ovada, Italy on 3 January 1694. His family later moved to Castellazzo, not far from his birthplace. His mother taught him from an early age that the strength to overcome any and all difficulties in life was to be found in the Passion of Jesus Christ. Inflamed with love for Jesus Crucified since his early childhood, Paul wished to dedicate his entire life to Him. Later, during a sermon, he felt himself inspired by the Lord to the love of Christ Crucified; he referred to that moment as the time of his “conversion”. Between 1715 and 1716, desirous of serving Christ, he went to enlist in the army of Venice. Inspired by the ideals of a crusade, he wished to fight against the Turks who were threatening Europe. One day, while in adoration before the Blessed Sacrament, he was made to understand that this was not his vocation. He then resigned from the army but remained for a while in the region, at the service of a family he knew. He later returned to his home. Even though his priest uncle had left him an inheritance so that he might marry, Paul renounced any such intention. To make memory of the Crucified. According to one witness, it was in a vision he had of the Blessed Virgin that Paul came to recognize the habit, the sign and the kind of life he was to lead, a life totally committed to Jesus Crucified. Having consulted with several prudent confessors, the Bishop of Alessandria, Monsignor Gattinara, vested Paul with the Passionist habit on 22 November 1720. Paul then spent the next forty days in the sacristy of the church of St Charles in Castellazzo. His experiences and the state of his soul during that “forty days” is made known to us in the “Spiritual Diary”. During that retreat he also wrote the Rule for possible future companions to whom he refers as “The Poor of Jesus”. On a visit, his brother, John Baptist, asked to join him but Paul refused his request, at least for the moment. At the end of this experience, the bishop authorized him to live in the hermitage of St Stephen in Castellazzo and to engage in the apostolate as a layman. During the summer of 1721 Paul went to Rome with the intention of having an audience with the Holy Father that he might reveal his inspiration concerning the future Congregation. The officials at the Quirinal, the then residence of the Popes, would not permit him entrance, thinking he was some kind of beggar. The first Passionist vow. Accepting this humiliation in imitation of Jesus Crucified, he went to the basilica of St Mary Major and, before the image of Our Lady “Salus Populi Romani, took the vow to consecrate himself to promoting the memory of the Passion of Jesus Christ. On his journey home he stopped at Orbetello for a while, at the hermitage of the Annunciation on Monte Argentario. Arriving at Castellazzo he was joined by his brother John Baptist. They then immediately left for Monte Argentario, to live there as hermits. Later, at the invitation of Bishop Pignatelli, they went into hermitage at Madonna della Catena, Gaeta. Bishop Cavalieri next permitted them to live in Troia for a while. They later returned to the diocese of Gaeta at the shrine of Our Lady of Civita, Itri. Their every attempt to found a community ended up in failure. In order to preach the Passion they had to be ordained priests and so they next went to Rome. While studying theology there, they also ministered to those infected with skin diseases in the hospital of San Gallicano. The brothers had the occasion to speak with the Holy Father when he visited the church of the Navicella on the Caelian hill and he orally granted them permission to make a foundation on Monte Argentario. In 1727, ordained priests, the brothers left Rome to live at Monte Argentario. The first retreat, dedicated to the Presentation of Mary, was inaugurated in 1737. Paul later presented Rome with the new Rule of the young Congregation. After making some mitigation, Benedict XIV gave his approval in 1741. Our Founder was a contemporary of other outstanding, saintly preachers such as St Leonard of Port Maurice, whom he met on one occasion, and St Alphonsus Liguori with whom he was acquainted. Like them, he too, for love of Jesus Crucified, was filled with zeal for the preaching of parish missions. Though he had held the office of Superior General from 1747 onward, he never stopped preaching missions or writing letters of spiritual direction. The Passionist Congregation did encounter much opposition on the part of some sectors of the Church for which reason some of the projected foundations had to be delayed until a pontifical commission passed favorable judgment on the Passionists. Passionist religious women. A country girl, Lucia Burlini, had one time spoken to Paul of the “doves on Calvary”, an image used by some who wished to share the same contemplative spirit, as did many religious. Though Paul had struggled for 40 years for its realization, it was not until 1771 that the Passionist Nuns were established in Corneto-Tarquinia. Paul appointed Mother Maria Crocifissa Costantini, a Benedictine nun, as the first superior. Pope Clement XIV granted her permission to transfer to the new convent. After the suppression of the Company of Jesus, Clement XIV transferred the Fathers of the Mission (Vincentians/Lazzarists) to the church of Sant’Andrea on the Quirinal and gave Paul of the Cross the house and basilica of Saints John and Paul on the Caelian hill. A short distance from the Coliseum, it was here Paul passed the last years of his life. Here, too, he was visited by two Popes, Clement XIV in 1774 and by Pius VI in 1775. He died a few months after the latter visit. His mortal remains are enshrined in the chapel dedicated to him which was completed in 1880 .